Journalism has been struggling financially for most of the 21st century, but journalism is in a particularly bad state following the recent election. There is a broad public perception of bias by “the media,” a category that lumps together everybody from the talking heads on cable news to the local school board reporter. This “media” both promoted the rise of Donald Trump, the consummate publicist, and missed the power of his message. Then there was the phenomenon of “fake news.” Not just news that was wrong or incomplete (that has existed every day for centuries) but complete fiction sounding like news meant to deceive and manipulate. On Facebook, it came from both sides. He just made that up, consistent with his flagrant disregard of “facts” on so many other issues, like the true unemployment rate. Was there voter fraud? Certainly, and probably more than Democrats will admit, since they refuse to look for it. Was it widespread or organized or even partisan? Probably not. For example, when he said, a hundred times, that he’s going to build a wall on the border with Mexico, reporters wrote that he’s going to build a wall. But to some supporters, that seemed to mean he was going to get serious about enforcing immigration laws, not that he would actually build a wall or have Mexico pay for it. Ultimately, facts about what actually is and what government does (or doesn’t do) are the basis of political journalism. People will frequently ask for my predictions about elections or legislation. We all want to know the future. My usual response is that I have a hard enough time getting the facts straight about what has already happened. Correctly predicting what is going to happen is much more difficult. Surely, I must know that politicians lie more than most people. Actually, after four decades covering politicos, I would have to say they actually don’t lie much more than most people. All people tend to shade the truth or lie to protect themselves or their interests. When caught in a misstatement of fact, most politicians will try to more accurately depict something that is verifiable. This is where Trump differs from most politicians. Sure, Hillary Clinton lied, most often to protect herself. Trump does not seem to care the least about what is true or verifiable as long as it fits whatever he wants to do. This my fundamental bias against Trump, if you want to call it bias. It is has little to do with political ideology — whatever his may be — but a strong belief that the basis of journalism is facts and what is true. This is what brings us to Gov. Larry Hogan and his troubling statements about the transportation scoring system that he wants to repeal, despite the legislature’s override of his veto of the original legislation. Why some road or highway or transit projects are funded and others are not is often a mystery. There is never enough money for everything, particularly after the Great Recession, so some projects win and some project lose. The legislature wanted to make that decision process “more transparent” by creating a complicated scoring system with nine goals and 23 measures. Some projects would score higher than others, justifying funding. The principal problem with the law is that its goals and measures are blatantly biased in favor of mass transit. On top of that, once the scores are arrived at, they are then weighted by population, putting a thumb on the scales for the largest counties. Hogan’s veto of a measure that seems to restrict his authority to fund projects was understandable. The legislature’s override was highly partisan. Gov. 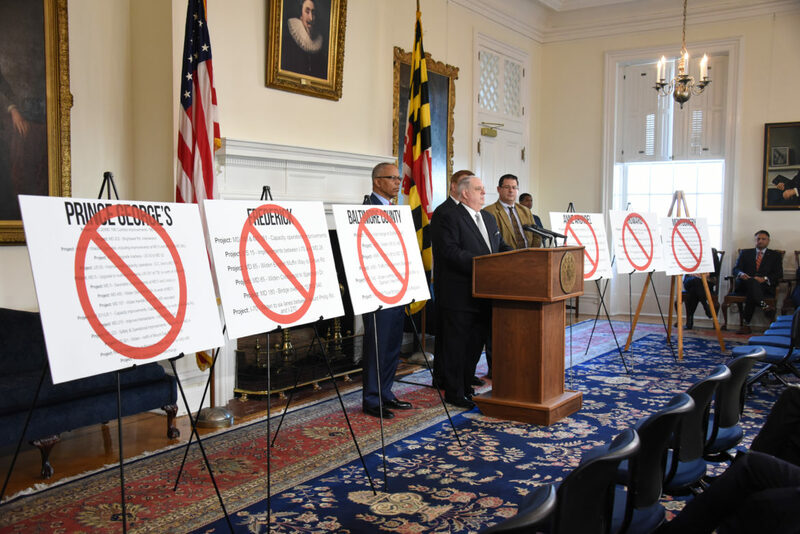 Larry Hogan presented charts of all the road projects he said would be killed by the transportation scoring law. Governor’s Office photo. Last month, Hogan made repeal of this new law his highest priority, and he misstated some basic facts about the bill. Hogan said there were no hearings on the legislation, but there were hearings on both the House and Senate versions of the bill in which his transportation secretary testified. He said there was little debate on the measure, but in fact there was substantial debate, particularly in the Senate. The bill was amended to make it more palatable. There was more debate on the veto override. Hogan denied that there were escape clauses in the law, but in fact there are two. One allows the administration to fund a project, despite a low score, by writing a letter giving a “rational basis” for the decision. The other says the law should not prohibit the funding of any project. The administration did its best to make a bad bill even worse by writing regulations that provide little leeway on scoring. “We don’t like the law, and we don’t like the regulations,” Transportation Secretary Pete Rahn told a committee in November. He acknowledged that the department could write letters justifying its funding decisions, despite the scores, but the won’t. “I don’t think it’s the department’s job to save the legislature from its own law,” Rahn said. Instead, Hogan insists that the law, and the regs his own people wrote to implement it, will force them to cancel 66 transportation projects. After the Hogan press conference, Warren Deschenaux, the director of the legislature’s nonpartisan staff, came back with a letter noting that 31 of the projects are not funded to begin with. Furthermore, transportation revenues are expected to be $1.6 billion less than originally estimated, so many of the projects would have to be canceled regardless of their scores. What are the facts? Are almost half the projects not funded? Will lack of money force others to be canceled? In general, reporters and legislators of both parties expect Deschenaux to stick to the facts, especially when it comes to budget numbers. That was true under Martin O’Malley and it is true under Larry Hogan. With bad regs due to take effect in February to implement a flawed bill, legislators seem prepared to tackle a rewrite of the scoring system. “Repeal and replace,” is how Democratic Del. Sandy Rosenberg phrased it, as he co-chaired the hearing on the regulations Nov. 18, echoing the Republican phrasing on Obamacare. Hogan seemed grudgingly amenable to that idea at the December press conference. It is possible to envision a scenario like the “repeal” of the “rain tax” Hogan widely touts. The legislature did lift the requirement for counties to impose a “stormwater management fee,” but it left in place all the requirements to spend money cleaning up the pollution caused by rain when it hits the ground. That could be a model for “repeal” of the “road kill bill” — repeal the bad bill, but create a new, more flexible “advisory” scoring system that Hogan could live with. But that’s just speculation. It may all be just partisan gamesmanship. We will learn the facts in a month or two. Maybe. I don’t remember giving the MarylandReporter or BaltimorePostExaminer permission to use my federally copyrighted photo in this article. Larry, we removed the photo. Larry, we are partner with MD Reporter so you have to talk to that website about the photo on their site.